If you’ve ever sung in a choir, you’ve probably sung something composed by Morten Lauridsen. He’s one of the most prolific and often performed choral composers of our time. As the recipient of the National Medal of Arts from the President in 2007 and several Grammy nominations, his music moves the hearts of audiences all over the world. In a documentary about his life, Shining Night he tours a renovated abandoned general store on a remote island in the Pacific Northwest, where he does most of his composing on a $50 piano. He took a chainsaw to the back wall, which faces the water, so he could watch the waves–inspiration for much of his music. You may have even heard this famous piece below. Morten Lauridsen gives a masterclass to Solis Camerata, under the baton of Kira Zeeman Rugen. 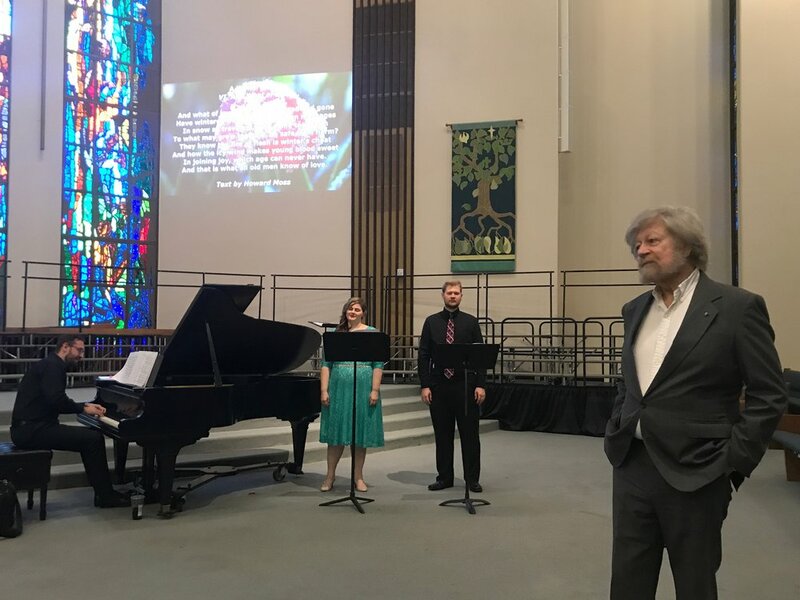 My dear friend and colleague, Stephen Schermitzler, put together an entire community choral festival in North Central Phoenix celebrating the music of Morten Lauridsen and the choral community in Arizona. Five different choirs totaling 200 singers came together to learn, perform, and grow in music. I had the pleasure of joining professional choral ensemble Solis Camerata to sing three Lauridsen works, which we coached with him individually and then performed in the final concert. It had been a while since I had sung with a small group (16 singers) of this caliber and it was truly a treat. I’m especially grateful to our director, Kira Rugen, for her artistry, and for allowing me to join such a great group. We ended our set with his “Ave Maria,” and let me tell you, I have never received a response to choral music like we did that night. You could hear a pin drop in the large, full church and the audience beamed at us as we walked off stage. This music, performed by “world-class musicians”–his words!– truly affects people. Classical music does not have to be “stuffy” or “just for the elite;” anyone can appreciate the pure power of the human voice. Here’s a clip from our masterclass evening, and it doesn’t even get to the good part yet! 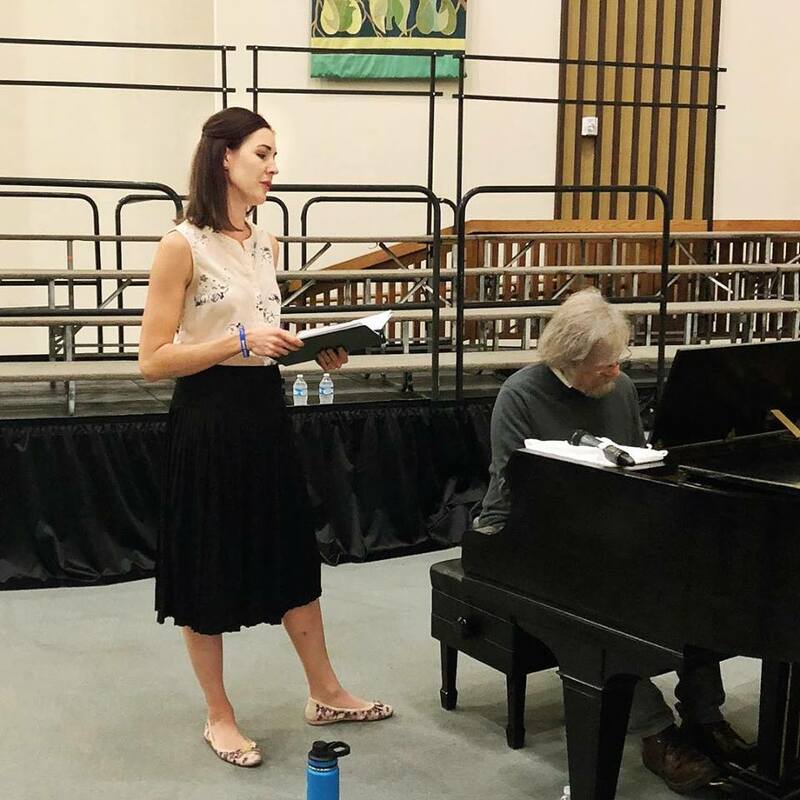 After we worked with Lauridsen, one of our members asked if he had a favorite composition. He likened the request to having to choose a favorite child, but eventually named a few, first of which was his cabaret piece, “Where Have the Actors Gone.” This just so happens to be the piece I was supposed to sing during his lecture on Saturday! Ahh! I immediately felt my gut drop. I had been a little unsure how to perform it stylistically, since it greatly differs from his other works, so I asked him about it personally afterwards. He offered, ‘Well, let’s hear it!” – “Uhh, ok!” He sits down at the piano and all of the sudden I’m singing this piece with Morten Lauridsen at the piano and he’s telling me I had done great work on it. What an encouragement! 8:30am- Try to warm up at home with girls “trying to help.” This is much different from when I’m traveling alone, or before kids, obviously. Heavily filtered to disguise the mess. I’m dressed, but sans heels, because Annabel’s trying them on with her unicorn pajamas. Leila’s at the piano, helping me with my low notes apparently. Miscellaneous toys strewn about simulate any distraction that may come about during a performance. 10:00 am- Morten Lauridsen Lecture Recital with 5 singers performing solo vocal works spanning his entire career. This was a really special recital of anecdotes, beautiful singing, and kind encouragement from Lauridsen himself, especially to our formidable pianist, Charles Szczepanek. Lauridsen remarked that he had never heard anyone else play one of the pieces other than himself. And yet, Charles played it just as he would have hoped. What a compliment and a testament! Katherine Thilakaratne and Stephen Schermitzler sing “Ya Eres Mîa,” as Lauridsen listens in admiration. From left to right: Charles Szczepanek, Aaron Smith, Katherine Thilakaratne, Haley McHardy, Cassandra Cárdenas, Stephen Schermitzler, Morten Lauridsen. Take a dramatic pause and wait for the words to come to you. Repeat the words you just sang. Repeat words from a previous verse or phrase. Without further ado, “Where Have the Actors Gone,” a tribute to the cabaret genre, by Morten Lauridsen. Text written by Lauridsen himself, as an allegory of actors ending a show representing the end of a relationship. 11:30 am- Rush home to re-warm-up more classically. Voice is already feeling tired. 12:00 pm- Arrive at opera audition in downtown Phoenix. Practice alternate nostril breathing attempting to calm nerves. 12:35 pm- Sing audition. (After considering seriously cancelling up until the day before.) Only had to sing one piece. Relief flows through my body. Not my best, but still super proud of myself for actually putting myself out there again after two years. Emotionally, I feel like I just gave birth. 2:30 pm- Back to check call-back list. No call-back. Relief settles in. 4:00 pm- Back to church for dress rehearsal. 7:00 pm- The Concert - join in as a section leader for another choir, sing with Solis Camerata, and then the Mass Choir. 9:00 pm- Greet Morten Lauridsen and have him sign my music. He had wonderfully nice things to say, and then gave me his flowers! Ah! 9:30 pm- Home to a sleeping house. Enjoy a glass of boxed wine by myself and wind down with an episode of Modern Family. It was a full and exciting day of singing! Thank you for reading! I hope this inspires you to check out a classical music concert sometime.